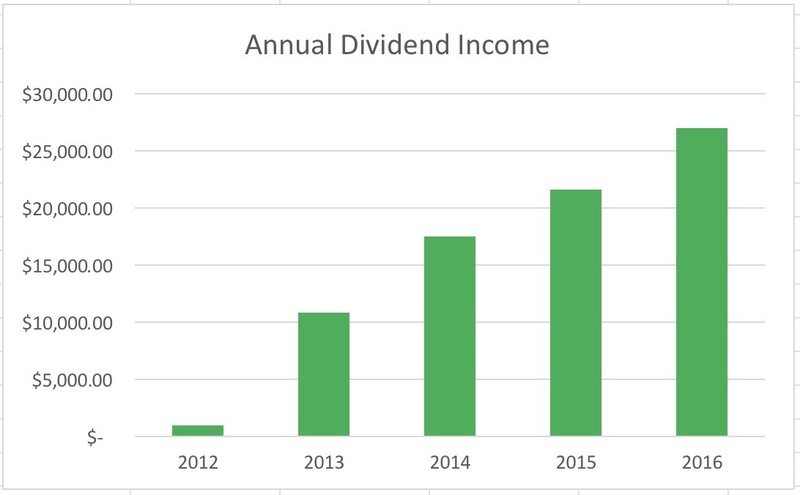 Before we get too far along in the year, I wanted to establish as starting point for my dividend income. As the year(s) go by, I can provide updates and explain why it is increasing. Annual Dividend Increases is my favorite reason. I get an income raise and I’m not investing any more capital or reinvesting dividends. High quality stocks with a commitment to paying dividends will increase their dividends once a year. In my experience, the biggest income raise comes from the increase in dividends per share. After all, I can only save so much money to buy more shares. My dividend income in 2016 was $27,019 or $2,251.58 monthly. – Sold off MRK in 2016 and COP in 2017. That explains the math difference. 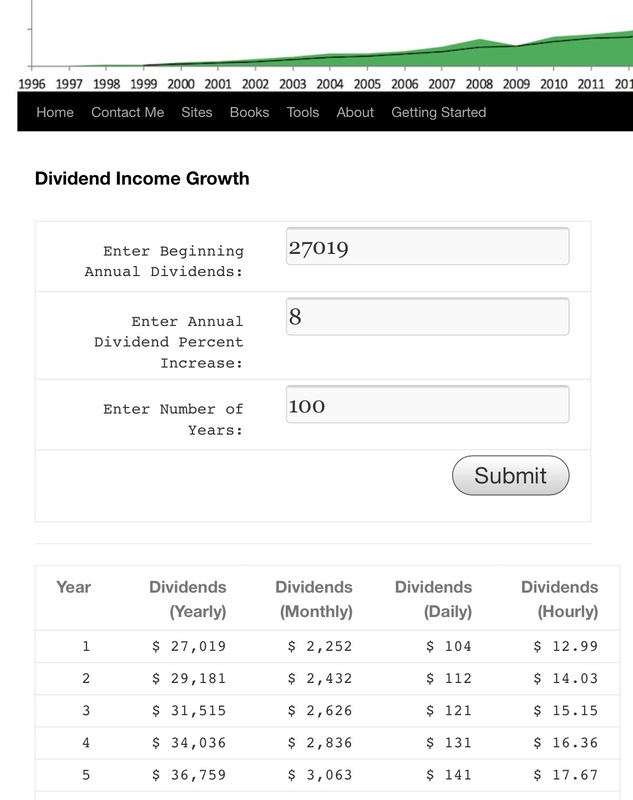 The math for annual dividend income is straight forward. The goal is to be able to pay all my monthly bills with dividend income. Dividend income is passive income and passive income is the key to Financial Independence. The 8% for Annual Dividend increase only factors in the stock raising its annual dividend. Over the last 5 years if include buying more shares and dividend reinvestment, that 8% number is actually closer to 14%. Plug 14% in there, the dividend income builds very quickly. Why do you use 100 years? I am 46 today. I know I’ll be dead, but I have kids and some day they will have kids, my grandkids. I want to leave a legacy for my family. I want them to never ever have to worry about money and be able to pursue work they truly enjoy. How awesome would it be for the grandkids to start with dividend income around year 35? Sorry buddy I am a little late to the party on your posts. I like the dividend route and pick some stocks based on this but how does this work with capital gains tax? I haven’t gotten really deep in it and I know it depends on your tax bracket but I was always afraid to get hammered when I cash out. Hey Jon, Good to hear from you. No problem, I just started posting in late December. For a normal, after-tax account (non-retirement), the highest tax rate on dividends is 20%, so about half of regular income tax max of 39.6%. Married Filing jointly, you can make up to $470,700 and only pay 15% in taxes. Dividend and capital gains are treated way better than regular income. Here are the tax tables for 2017. Regular income tax rates are on the left and dividend and capital gains rates are on the right, http://www.schwab.com/public/schwab/nn/articles/Taxes-Whats-New. I’ll be in FL soon so maybe we can catch up. And if you are not working at all (retired), you can have $75,900 in capital gains and/or dividends and pay 0% tax. With our deductions, we can have about $105,000 in capital gains and/or dividends and pay 0% tax. Yeah that’s lower than I thought for the tax rate I was thinking it was a heck of a lot close to the income tax rate. So reinvesting the dividend is the way to go for the most part at our age? Yes I am aware that I am older than you!! Yep, that is what I am doing. Haha, way older.